Every winter, my life becomes a little like Groundhog day. Or Groundhog week. In that every Monday the husband asks why he can't have minted lamb kebabs for tea and I patiently explain that xyz supermarket only sells minted lamb kebabs during barbecue season. He looks perplexed, his brow furrows, I offer something else to appease him (wine; a takeaway; ham, egg and chips...) and he's happy for another seven days. The following Monday, the exact same conversation is had again. And again. In fact, I must say I have never been so relieved to see processed meat products in a shop as when xyz supermarket resumes selling minted lamb kebabs. Last year, I did try finding a suitable recipe online to make my own. After a few disasterous attempts, we settled on one that used copious amounts of mint sauce. They tasted pretty much like the shop-bought ones but instead of having a texture of foam rubber, they actually felt just a little bit meaty. But, like a fool, I forgot to save the link to my mac, I switched phones and the recipe was lost forever, no matter what combination of words I typed into Google. 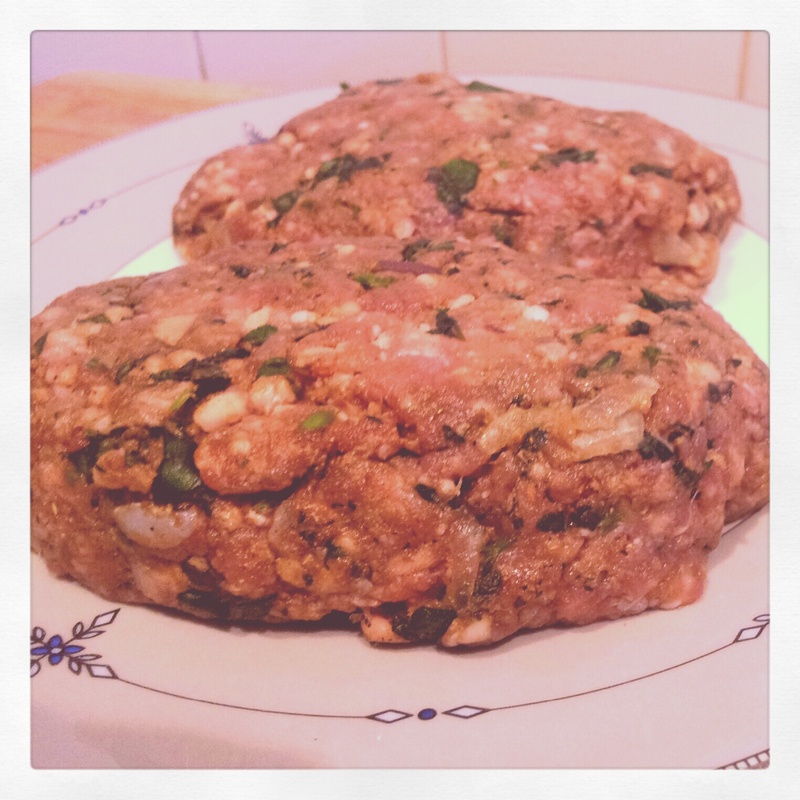 So when I got given Lorraine Pascale's Home Cooking Made Easy for Christmas, I was really pleased to see her recipe for minted lamb burgers. 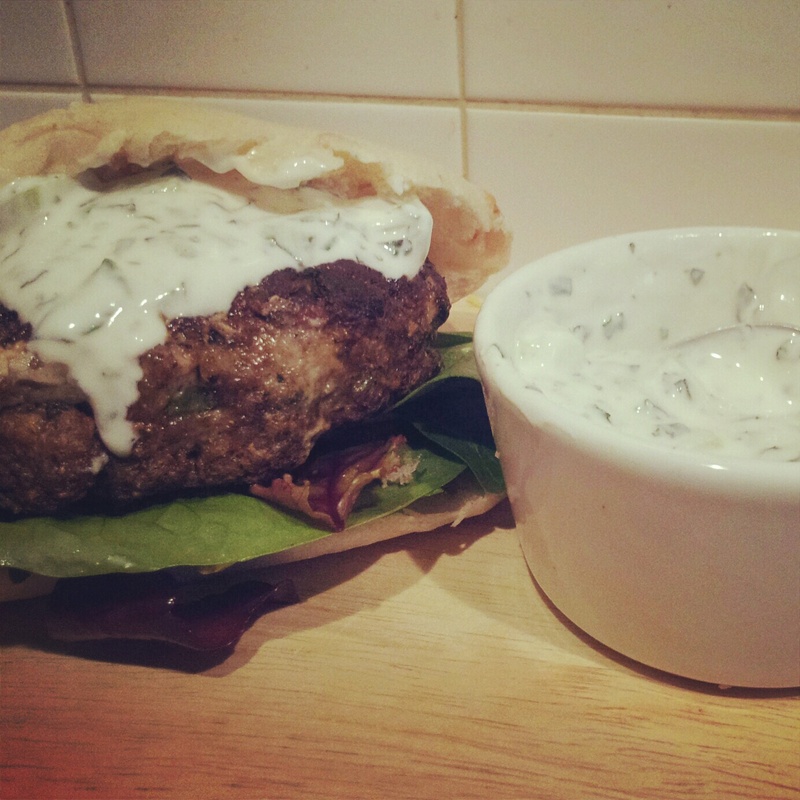 After all, a minted lamb kebab is just a burger on a stick. I've been meaning to try them for ages so when I decided to make Dan Lepard's Perfect Plain Pita yesterday, these seemed like the ideal filling. Having looked for the recipe online, I was a little dubious when I found the only reference to them on this blog, but each to their own - I felt duty-bound to try them. I've never had much luck with burgers and meatballs. I often find that the taste is lacking and all you get is that 'slab of meat' flavour. Having watched James Martin making burgers some time ago, I recently realised that it's not just about the herbs and spices you throw in that makes the difference - it's the level of seasoning (ie salt and pepper) that brings out the flavour. That's always the awkward thing with recipes. They say 'season to taste' but how can you taste a raw meat product? Some chefs suggest frying off small bits of the mixture and adjusting the seasoning if it's not right. I just threw caution to the wind today and lobbed in a healthy pinch of Maldon sea salt, alongside the very generous teaspoonsful of coriander, cumin and cinnamon. The recipe also calls for a smalll bunch each of fresh coriander and mint too. I forgot the garlic in my haste. And for once, my burgers had flavour. So that's obviously it. More salt. Exactly what we're not supposed to do. Or maybe they would've been just as tasty with a tiny pinch of salt. Now, I don't know. But I'll definitely make these again and use less salt and do the 'fry a little bit, taste, adjust seasoning' method to see just how little salt I need to get a decent flavour. The mixture seemed a little too soft to mould onto kebab sticks. 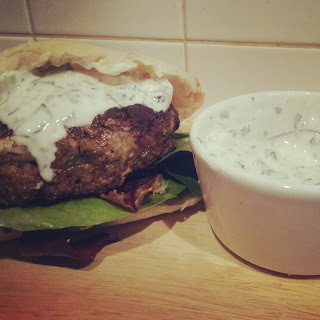 I tried to convince the husband that a minted lamb kebab is just a burger on a stick, but he's having none of it. So my next attempt will also include trying to chill them before cooking to see if they'll solidify. Also, maybe browning in a pan and then baking rather than grilling - in the same manner as the burgers are cooked - will stop the kebabs falling off the sticks. These will be fantastic come barbecue season! I'm also using the remainder of the mixture for tomorrow's recipe of Morrocan lamb meatballs with herbed couscous. Watch this space! Fry the patties over a medium heat for 2-3 minutes each side until browned. Place the browned patties onto a baking tray and bake at 220c/200c fan for 8-10 minutes until thoroughly cooked.